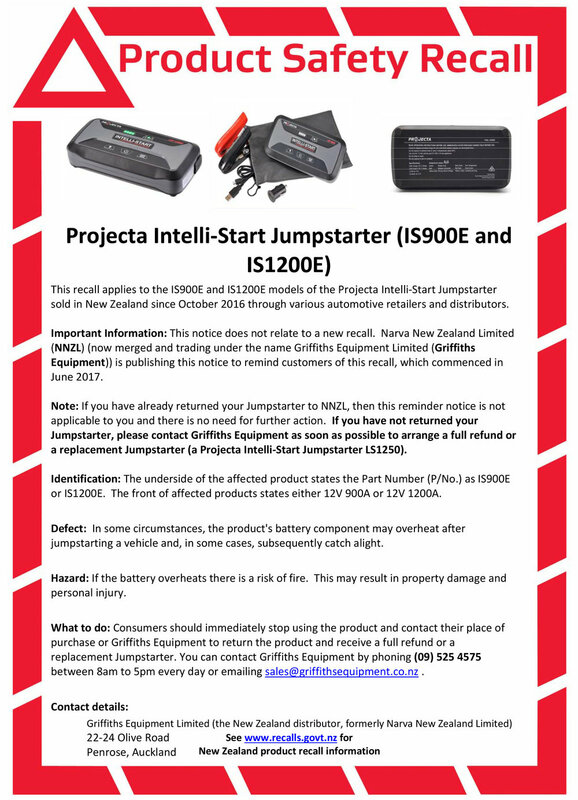 Brown & Watson International Pty Ltd (BWI) in Australia and Narva New Zealand are recalling the Projecta IS900E and IS1200E series Jumpstarter packs due to reports of the battery overheating after jumpstarting a vehicle and, in some cases, subsequently catching alight. There have been no reported injuries. These models, which are powered by a Lithium Cobalt (LiCo) battery, have been sold through various retailers and distributors since September 2016. The Projecta IS1500 is powered by a different battery pack (Lithium Iron Phosphate LiFePO4) and has not been affected by the overheating issue. The safety and wellbeing of customers is our number one priority and as a result the company has decided to take this action. BWI is currently investigating the cause of the issue and will not be returning the product to the shelves until the problem has been fixed. Consumers who have purchased one of these jumpstarter packs should stop using the product immediately and return it to the place of purchase for a full refund. Alternatively, consumers in Australia may call the Australian Product Support Hotline on 1800 422 422 between 8am and 8pm AEST every day or visit www.recall-jumpstarter.com.au. For purchases made in New Zealand consumers may contact their place of purchase or Griffiths Equipment to return the product and receive a full refund or a replacement Jumpstarter. You can contact Griffiths Equipment by phoning (09) 525 4575 between 8am to 5pm every day or emailing sales@griffithsequipment.co.nz .